Like most peoples of antiquity, the Israelites used two kinds of shields—a large one which covered the whole body and was carried by the heavy-armed infantry, and a small, easily managed one, carried by the light-armed troops. The former was called "ẓinnah"; it served to protect the spearmen (I Chron. xii. 8, 24, 34; II Chron. xiv. 8, xxv. 5). The men of the tribes of Judah and Naphtali were armed with such shields, together with spears. Prominent warriors and leaders had their shields carried before them by special bearers (I Sam. xvii. 7, 41). The ẓinnah served the Psalmist as a figurative expression of the protecting favor of God (Ps. v. 13 et al.). The small shield was called "magen," and was carried by the bowmen and light troops (I Chron. v. 18; II Chron. xiv. 8, xvii. 17), as well as by the king(Ps. xlvii. 10, lxxxix. 19). That the difference in size between the two kinds of shields was very great is seen from I Kings x. 16 et seq. and II Chron. ix. 15 et seq., according to which twice as much gold was required to cover the one as the other. 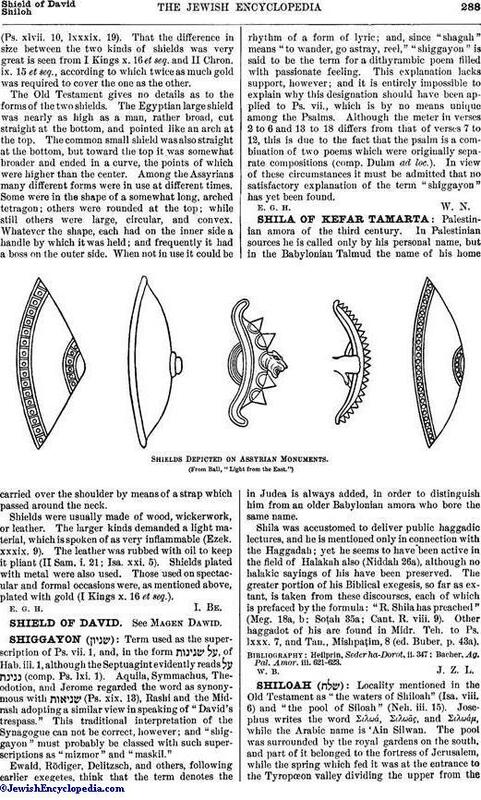 The Old Testament gives no details as to the forms of the two shields. The Egyptian large shield was nearly as high as a man, rather broad, cut straight at the bottom, and pointed like an arch at the top. The common small shield was also straight at the bottom, but toward the top it was somewhat broader and ended in a curve, the points of which were higher than the center. Among the Assyrians many different forms were in use at different times. Some were in the shape of a somewhat long, arched tetragon; others were rounded at the top; while still others were large, circular, and convex. Whatever the shape, each had on the inner side a handle by which it was held; and frequently it had a boss on the outer side. When not in use it could be carried over the shoulder by means of a strap which passed around the neck. Shields were usually made of wood, wickerwork, or leather. 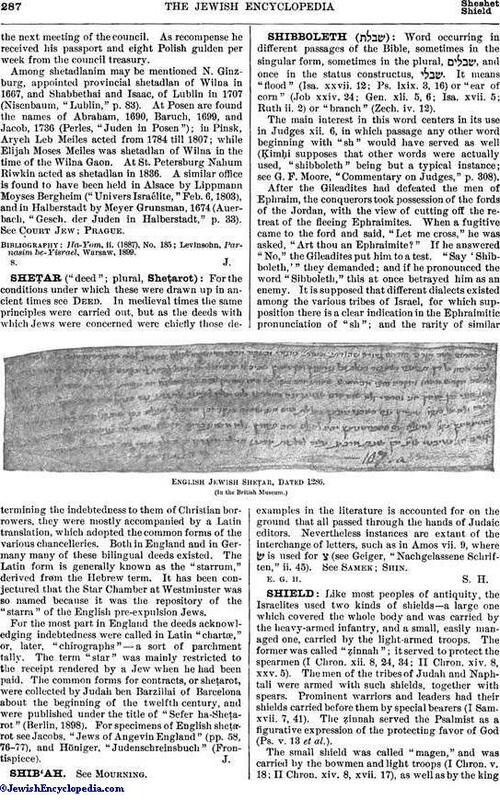 The larger kinds demanded a light material, which is spoken of as very inflammable (Ezek. xxxix. 9). The leather was rubbed with oil to keep it pliant (II Sam. i. 21; Isa. xxi. 5). Shields plated with metal were also used. Those used on spectacular and formal occasions were, as mentioned above, plated with gold (I Kings x. 16 et seq. ).